chinese cabbage for the meat patties . and the Wild Boar had a good time feasting them too LOL! Cut the chinese cabbage into strips. 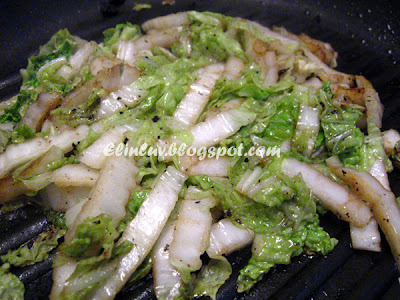 Use the aromatic oil drippings from the meat patties to saute the chinese cabbage in the grill pan. Lightly stir fry till cooked. 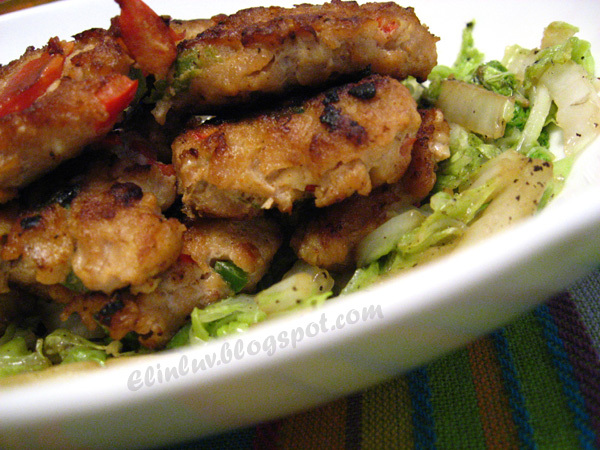 Add sea salt to taste before dishing up and served them as base for the meat patties. Put all the ingredients together in a mixing bowl. Stir them vigorously till well combined . 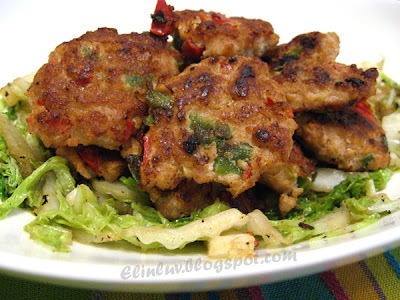 Shape them into small patties and pan fried them in olive oil on a grill pan till both sides are browned and cooked. Served the cooked patties on the cabbage lined dish. What a flavorful and unique dish! Sounds delicious! 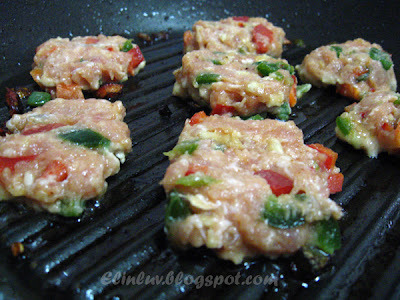 I like this love try with ground chicken, looks soooo good! Elin! I've missed you. 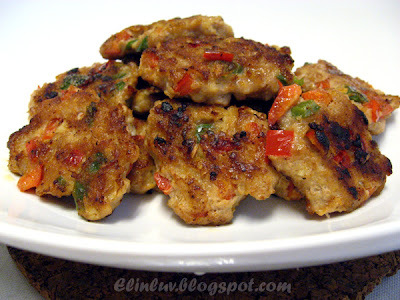 These capsicum patties look delicious :) Can I have some? That patty is different yet delicious! I am thinking of using up my ground turkey to make these patties ... thank you for the inspiration!! these sound yummy and your tarts are lovely! I would be very happy too if somebody would cook that for me...but so sad! Nobody! Sobssss!!!!! thanks for your patties idea, i think patties are so verstaile, can be filling for buns, can also do with spaghetti and even for snacking! Capsicum is something I wanted to try out! So coincidence that by the time I have the ingredients but can not cook them cause my hubby & the kids were having chicken pox! The elderly said it is no good taking cucumber spises becaue it's poisonous for chicken pox carrier. Roxan....miss you too. Glad you are back and more cooking and baking and more recipe sharing. I have a carnivore at home too and I'm sure that he'll be very happy if I make these yummy looking meat patties. Happy new year to you and your family too! Gong Xi Fa Cai!